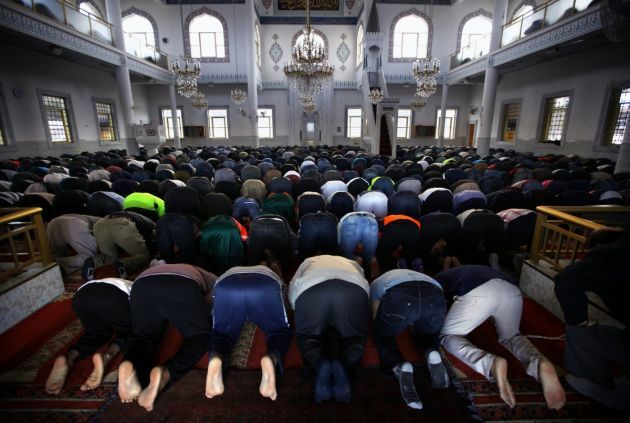 (Photo: REUTERS / David Gray)Muslim worshipers pray in the Gallipoli Mosque located in the western Sydney suburb of Auburn September 26, 2014. Prominent Australian Muslims say their community is being unfairly targeted by law enforcement and threatened by right-wing groups, as the government's tough new policies aimed at combating radical Islamists threaten to create a backlash. As concerns about security have grown within the broader community, so too has the antipathy being expressed towards the Muslim population, which numbers around half a million people out of Australia's 23.5 million, with about half of those living in Sydney's western suburbs. YouTube Muslim preachers have gained in popularity among Muslim youths, but Australian Islamic leaders are worried because they believe it can be used to reflect violent views that are not compatible with the religion. Islamic Council of Queensland president Mohammed Yusuf says that youths should avoid anyone who speaks about Islam on YouTube as they are not affiliated to any official mosques. "It is very difficult to keep track of what's going on because they operate on their own," he told the AAP, the Australian national newswire. Uzair Akbar, an imam at Holland Park in Brisbane's south, said it is hard for youth centers to check out speakers on YouTube compared to those speaking in mosques. "A lot of people have the gift of the gab, they can speak, but religion is not only about speaking," he said. A possible example to this is Feiz Mohammad, an Australian Muslim preacher originally from Lebanon, noted for his Islamic extremism. He was called a "virtual spiritual sanctioner" by former United States Senator Joseph Lieberman as he uses the internet to bring a level of religious justification for Islamist terrorist violence. He has given lectures in which called Jews "pigs" while laughing about killing them. Since the identities of the speakers are unknown, the leaders say there is a possibility that the truths they are sharing are false. Yusuf encouraged young Muslims to join a mosque instead of listening to YouTube preachers who spread questionable teachings. He said that reading the holy Qur'an is not enough. One has to be part of a mosque to discuss the faith and grow in the process. Being part of a mosque is to be part of a "wider community," he said. The Halal Tube has not been mentioned by the Islamic leaders but it is one of the Islamic video content providers that posts various speakers via YouTube, Google Video, and other websites. Its focus is primarily on Islamic lectures, talks, and khutbah or sermons. But Imam Akbar said that mosques are open to helping youth centers check the reliability of the videos and potential speakers.